Both electric cars and renewable energy stand to gain significantly from cheaper storage. 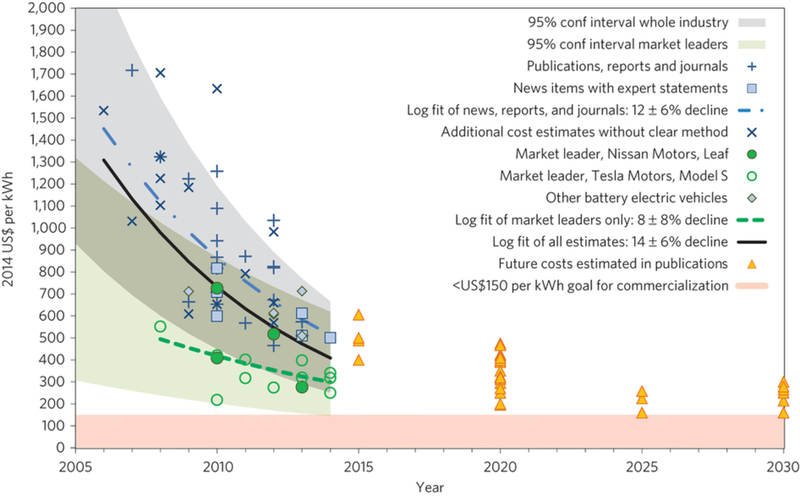 The analysis also estimated that the industry as a whole is currently seeing annual battery cost reductions of 14%, while for leading players with already lower costs this is closer to 8%. It is therefore predicted that battery cost for all involved should converge to around US$230 per kWh in 2017-2018. This is seven years earlier than estimated in our previous analysis. This is exciting …But can we talk about this with some maturity? The problem is analysed in an important paper by Weißbach et al.1 in terms of energy returned on energy invested, or EROEI – the ratio of the energy produced over the life of a power plant to the energy that was required to build it. It takes energy to make a power plant – to manufacture its components, mine the fuel, and so on. The power plant needs to make at least this much energy to break even. A break-even powerplant has an EROEI of 1. But such a plant would pointless, as there is no energy surplus to do the useful things we use energy for. There is a minimum EROEI, greater than 1, that is required for an energy source to be able to run society. An energy system must produce a surplus large enough to sustain things like food production, hospitals, and universities to train the engineers to build the plant, transport, construction, and all the elements of the civilization in which it is embedded. Weißbach et al. calculated the EROEIs assuming pumped hydroelectric energy storage. This is the least energy intensive storage technology. The energy input is mostly earthmoving and construction. It’s a conservative basis for the calculation; chemical storage systems requiring large quantities of refined specialty materials would be much more energy intensive. Carbajales-Dale et al.2 cite data asserting batteries are about ten times more energy intensive than pumped hydro storage. Adding storage greatly reduces the EROEI (the “buffered” values in the figure). Wind “firmed” with storage, with an EROEI of 3.9, joins solar PV and biomass as an unviable energy source. CSP becomes marginal (EROEI ~9) with pumped storage, so is probably not viable with molten salt thermal storage. The EROEI of solar PV with pumped hydro storage drops to 1.6, barely above breakeven, and with battery storage is likely in energy deficit. This particular study does not stand alone. Closer to home, Springer have just published a monograph, Energy in Australia,3which contains an extended discussion of energy systems with a particular focus on EROEI analysis, and draws similar conclusions to Weißbach. Another study by a group at Stanford2 is more optimistic, ruling out storage for most forms of solar, but suggesting it is viable for wind. However, this viability is judged only on achieving an energy surplus (EROEI>1), not sustaining society (EROEI~7), and excludes the round trip energy losses in storage, finite cycle life, and the energetic cost of replacement of storage. Were these included, wind would certainly fall below the sustainability threshold. Hi Jason. In fairness to Valentin, he is talking about batteries for electric vehicles, and the utility of an electric vehicle would be measured in a very different way than EROEI and take into account societal factors (e.g. reduced smog in Beijing) as well as personal factors (e.g. great acceleration and home energy integration). And in fairness to stationary storage, it’s utility is not best measured in combination with generation plant, but through the range of services that can be provide to the network (e.g. voltage regulation and peak shaving), the market (e.g. effective ancillary services), the retailer (e.g. a physical hedge against high wholesale prices), and of course the customer (e.g. self consumption of solar energy and backup power). I think only a minority of stationary energy storage will be installed at generation sites. But thanks for the reference to Weißbach et al. which I hadn’t heard of before, great work. Geoff. One this that does concern me is the lifespan of current Li-ion batteries. I am seeing indications that will result in vehicles with short useful lives and probably almost zero resale value. Low battery replacement cost is a welcome improvement, but a 7 year working life may make EVs environmentally worse than their longer lived ICE counterparts. If the much smaller Prius battery is anything to go by, I feel that this is going to be the next reputation hurdle for the EV makers. Stationary batteries are a wholly different proposition with much less stringent weight, power and volume requirements, so many more materials are available for consideration. We should expect utility compatible lifespans of 20+ years and low levelised costs. Aqueous Sodium Ion batteries are showing promise in this area. my issue with the Weissbach paper is the results are highly dependent on the amount of buffering and over-capacity factors assumed. He has used storage requirements of 10 full load days for wind and solar PV. This may make sense if you are trying to power the entire country (or your house) with only wind, or only solar, but if you are using a variety of sources then this assumption can be completely wrong. I may be going off-track a little, as this article is more about batteries for home storage and cars, so perhaps the numbers in the Weissbach paper are reasonable for this scenario. But when you try to use them for powering an entire country, that’s when things get ridiculous. For example, the UNSW 100% renewable study, where one of the scenarios has 34 GW of wind and 30 GW of PV, Weissbach would therefore require 640 GW-days of storage, or 15 TWh. This is an extremely large amount, so it’s not surprising it has a poor EROEI. In contrast, the UNSW study has indicated that we can get 88% of our electricity from wind & solar, with another 6% coming from gas turbines and 6% from existing hydro, and only require about 200 GWh of storage. They have calculated that this system could meet our demands on an hourly basis throughout the year meeting our current reliability standards. Clearly, having just 200 GWh instead of 15 TWh of storage makes a massive difference any EROEI calculations that include storage. I should also mention that Weissbach is using figures from an old turbine in Germany’s poor wind resource, with a resultant Capacity Factor of 23%. In contrast, the average wind farm in Australia is obtaining a CF of 34%. Clearly a modern turbine in Australia’s better wind conditions will also reduce storage requirements. Oh please, not that nonsense again. D. Weißbach is a Dipl. Phys. in nuclear physics, currently working on his Ph.D. and he is affiliated with the so called “Institute for Solid-State Nuclear Physics” which is nothing other than a private fan club for molten salt reactors of nuclear physicists that still can’t get over the fact, that renewables have stolen their thunder. He has an agenda and serves it by making poor assumptions of capacity factors, needed storage capacities, outdated solar module efficiencies and industrial processes. I am sorry that this website has no English version, but here in Germany noone that matters takes them seriously. EROEI is notoriously complicated by the assumptions but the one thing that can not be denied under any circumstances is the current model of economic growth requires an ever increasing amount of energy per capita for development and renewable energy sources have a lower EROEI than fossil fuels meaning under the current economic orthodoxy it will be impossible to successfully swap fossil fuels out for renewable energy sources. I’m talking full replacement not just deep penetration into the grid due to lower EROEI. If a person insists on using obsolete information and making unrealistic assumptions, that person deserves to be criticized personally. No one can argue that renewables have the same EROEI as fossil fuels – they don’t that is a fact. it is far more complex than that…. I didn’t say that. After we have swapped our energy sources, we will still have ingrown toenails and obnoxious bosses, same as we do now. What we won’t have is increasing carbon gas pollution. Actually, if you think about it carefully, the EROEI is better for renewables than it is for fossil fuels. If you dig up some coal and burn it, or pump up some oil and burn it, you get a certain amount of energy. If you want more energy, you need to dig more coal or pump more oil. But if you install a wind turbine or solar panels, for the price of a little maintenance (wind) or almost no maintenance (solar), you get energy out for years and decades into the future. The EROI of renewables is high enough. Nobody argues against improving energy efficiency, because it totally makes sense economically and of course has huge potential cause current energy consumption is very stupid and inefficient. There are a lot of problems that have to be adressed to solve the worlds problems, bashing the EROI of renewables as insuffient still is just plain wrong. I want to see far less consumption and society to be far less materialistic too and there are billions of reasons for that but that doesn’t take anything away from the vast amounts of energy the sun sends to earth and our capability of accessing that. Do these EROEI calculations take into account health costs and the environmental damage associated with CC? If it turns out the energy profit isn’t sufficient with renewable energy then we won’t have health care. …this is the point that everyone is missing in all these conversations : scale. Renewable energy has less bang for our buck full stop, no one can argue that fact, what this means when you think it through is there will not be enough spots at the table for everyone, because we’ll be forced to shrink the total enterprise. Radical social upheaval will result assuming we try to run consumerism on renewable energy sources. Technology is not going to be our ultimate problem it is our culture, our alienation from our intrinsic interconnectivity with the Universe that has lead us to the crisis we face now and without addressing it no amount of wishful thinking about renewable energy will solve the root crisis. Lol, this is exactly the oposite. Environmentalists all the time expose ulterior motives, affiliations and worrying funding of climate scepitcs and rightly so. I totally disagree, renewable energy could run the whole show. I loathe excess capitalism as much as the next guy, but don’t try to bend physics to fit your ideology. I am totally with you that mindless consuming unnessary crap should stop asap and I am worried about the biocapacity of the earth, soil degradation, the overused carbon capacity of oceans and atmosphere, waste disposal problems, collapsing eco systems, extinction of species and so on. What I am not worried about is the EROI of renewables and their potential to scale. Read my response to Coley. To address the issue you raised we need to stop growing the economy this is not possible without a totally radical cultural shift and my bet is this will be a bridge to far and we’ll attempt to run consumerism on renewable energy and it’s just not going to happen for the reasons you brought up above. … it’s the scale of the ENTIRE endeavour that renewable energy can’t support. I care about what’s true regarding the physics of things, that is where I am coming from regardless of growth debates or anything. Your agenda obviously is to have society turn away from “endless growth” and consumerism. The funny thing is, at least in my point of view, that you are detrimental to your own goals by bashing renewables. I think you are factually wrong on the physics side of it in the special case of EROI of renewables being insufficient, but even regardless of that, you should encourage people to turn 100% renewable and super energy efficient and not scare them away, by telling them that their entire civilisation will collapse if they go renewable. The change in society you desire is in my book more likely to happen along the way, so why would you send people running scared back to fossil fuels and nuclear, that are not needed and that destroy the planet? You are mixing things up and throwing everything in one basket. The truth is that renewable energy IS the solution to a lot of problems, of course not to all the problems. Their EROI is lower than fossil fuels or nuclear but certainly high enough to sustain human civilization, especially when energy consumption gets a lot smarter and more efficient. By bashing renewables you help noone. Focus on standing up against fossil fuels, nuclear, plastic, materialism, neoliberalism etc. You won’t scare people into changing anyway. You have to offer a viable alternative for a good life (good life obviously meaning without all the things above, for instance without cheap useless plastic products from China). That is a lesson learned from the green movement in Germany and that is how you change the world. The Weißbach study, for example, used transparent calculations based on published data and was accepted for publication in Energy, a peer-reviewed journal. And the authors were able to put up a spirited defence of the work in the face of a critique by Marco Raugei of the Faculty of Technology, Design and the Environment at Oxford Brookes University in the UK. In a nutshell, the current work on EROI and similar measures suggests there could be something fundamentally wrong with the move to renewable generation sources in general and the use of energy storage to balance intermittent sources in particular. The question is: what could and should the energy storage industry do about it? EROEI is meaningless with renewable energy, because renewable energy can be self-looped. I.E it is possible to use solar power to manufacture solar panels. For example, for any practical purposes, the EROEI of Tesla Gigafactory batteries will approach to infinity, because that factory will be roughly 100 % powered by locally produced renewable electricity. EROEI was meaningful in the fossil fuel era, but that era is long gone. That what I said above, is quite easy concept. Because it is so easy, it might also be very hard to understand. But I am sure that you can understand, that only the cost of solar panels measured in dollars matters. Actually, we could run sustainably our economy even if eroei of solar panels would be less than 1. This is because if some remote location, such as in Iceland, there is very cheap and sustainable geothermal and wind power, then it is possible to establish there solar panel factory and export panels to the rest of the world. This would effectively be transmitting power from Iceland to Europe without HVDC connection. Similar the EROEI of synthetic methane for energy storage, is by definition below one. Still it can be economically viable to run synthetic methane plant. But this was of course what you already understood. Therefore even if EROEI of solar panels is even marginally above one, we can self-loop solar power factory, and in effectively we can gain infinite EROEI. Of course if it required 10 sqr.km Sahara to be covered with solar panels in order to produce 1 sqr.km solar panels for European markets, then it is very hard to see how it could be economically viable. But if solar panels are cheap enough, we could produce sustainable solar power even if EROEI was just 1.1.